Keenetic routers support multiple simultaneous uplink connections (this feature is sometimes also called Multi-WAN). It is possible, for example, to plug in two Ethernet cables from different ISPs to the same Keenetic router and set up a primary and a backup connection, or you can, for instance, use a dedicated Internet connection via Ethernet for a primary link, and an Internet connection via cellular 3G/4G/LTE network as a backup. This feature set is supported at every Keenetic device. An interface is turned off by a device administrator. Each time any of the above conditions is met, system will switch to the default gateway of the next interface (by a priority order in the Default policy profile). The interface that lost its connectivity will meanwhile be reconnected — unless it has been turned off, that is, and if that attempt is successful then the default gateway will be switched back to a primary connection (i.e. a higher priority one). Please see the Connection priorities article for more information on Internet connection priorities and using connection profiles. Let's take a closer look at the example of connecting Keenetic router to two different ISPs over a dedicated Ethernet line and configuring the backup of the main Internet channel. The primary Internet channel should be connected to the blue port 0 (WAN/Internet) of the router, and the cable of the backup Internet channel can be connected to any of its available ports. The Ping Check mechanism is enabled on this primary connection. It will continuously test whether the Internet connection is working properly. In the event of a failure of the main network connection, the Keenetic router will automatically switch to the alternate channel, and when the main connection is restored, it will return to it. It is recommend to enable Ping Check on the main connection. After completing the primary connection setup, make sure that the Internet connection has been established. 2. Proceed to setting up the backup connection. 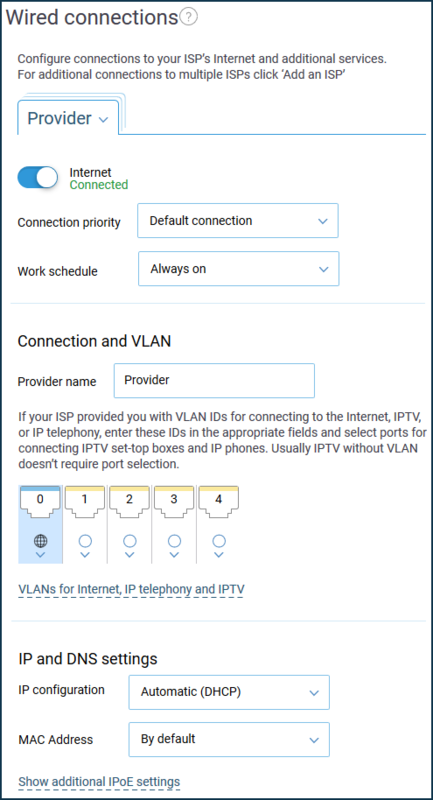 In the KeeneticOS, you can reassign any home network port and configure it to connect the ISP's Internet cable (i.e., this port will work as one another blue port 0 (WAN/Internet). To connect to multiple ISPs at the same time, press '+ (Add an ISP)' on the 'Wired' menu page. Then set up Internet access according to the conditions of your ISP connection. 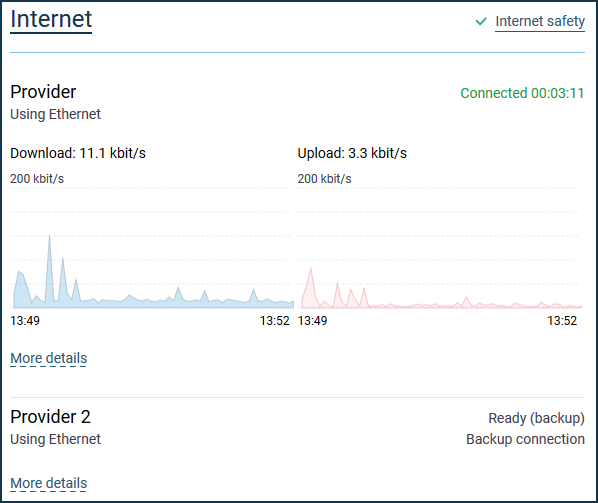 Then connect the Ethernet cable of the second (backup) Internet channel to the port specified in the settings (the port 1 in our example). 3. 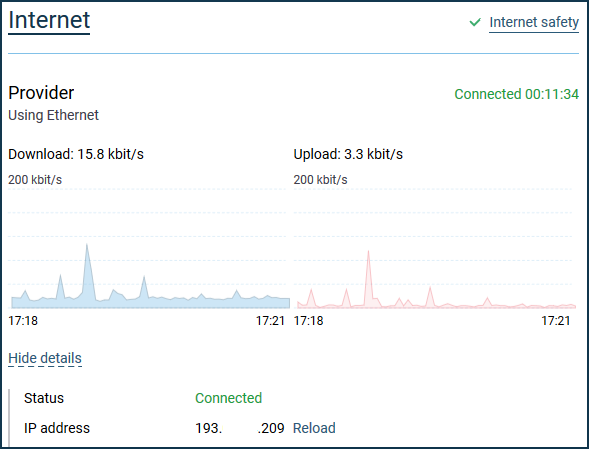 When Keenetic router is connected to two or more ISPs, you can also set up connection priorities. For more information on that, please see the Connection priorities article. By default, the primary connection is set to a higher priority. Backup connections, that is, ones with a lower priority, will be put on a standby (idle until needed). 4. 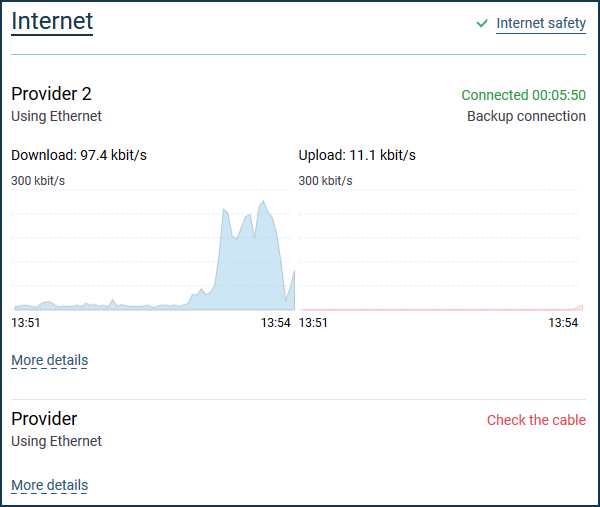 After we connected two Ethernet cables from different ISPs and thus finished the configuration of the main Internet channel redundancy setup, the Dashboard's Internet info panel should now display the current active connection (Provider) and the standby connection (Provider 2). 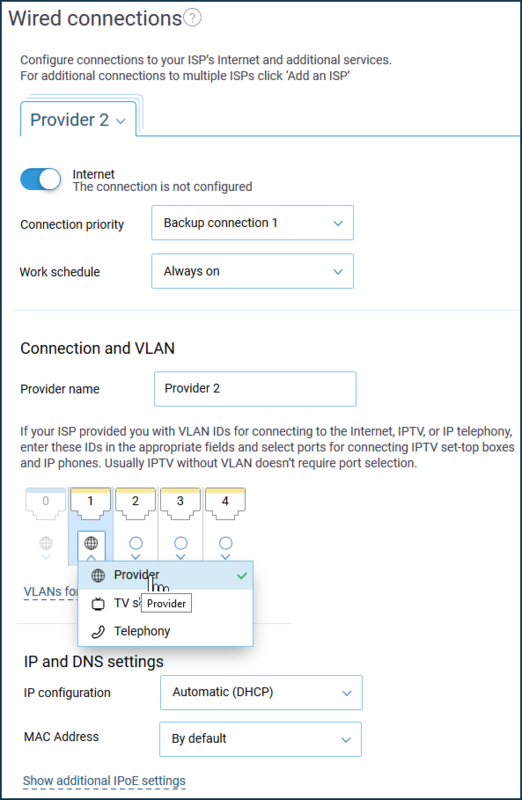 To check the functionality, disconnect the main ISP network cable from the blue port 0 (WAN/Internet) of the router. If the primary connection is impossible to establish, the KeeneticOS will automatically switch to the backup channel. When the main connection is restored, the Keenetic will automatically return to the main channel.